Abstract: This project presents a novel mixed reality tracking system for collaborative tabletop applications that uses decorative markers and embedded application markers to create a continuous and seamless tracking space for mobile devices. 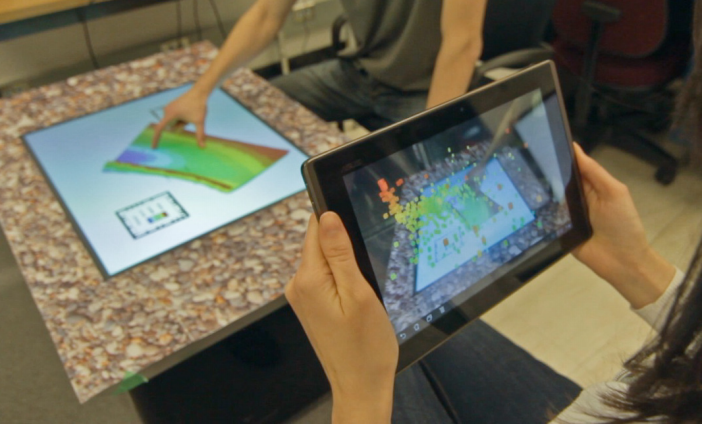 Users can view and interact with mixed reality datasets on their mobile device, such as a tablet or smartphone, from distances both far and very near to the tabletop. We implement the tracking system in the context of a collaborative reservoir engineering tool that brings together many experts who need a private workspace to interact with unique datasets, which is supported by our system. P. Lapides, N. Sultanum, E. Sharlin, M. Costa Sousa, “Seamless Mixed Reality Tracking in Tabletop Reservoir Engineering Interaction”, Proceedings of the International Working Conference on Advanced Visual Interfaces (AVI 2012). Capri, Italy. Extended abstract and poster. pp. 725-728. P. Lapides, N. Sultanum, E. Sharlin, M. Costa Sousa, “Seamless Mixed Reality Tracking in Tabletop Reservoir Engineering Interaction”, Technical Report 2012-1024-07, April 2012 , University of Calgary, AB, Canada. Two users interacting with a reservoir dataset.